There's no messing about with this overview of director De Palma's career. No actors, producers, critics, writers or collaborators chime in with their opinions. There's no narration or an off-screen interviewer with probing questions. 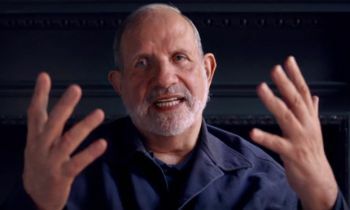 This is just De Palma in a mid-shot taking us through each and every one of his films – from his first shorts to 2012's Passion - slipping in some trivia and on-set stories while talking about influences (mostly Hitchcock whom De Palma sees as his heir) and the thinking behind his most famous shots (Blow Out’s 360 and Carlito's Way's long tracking shot among them). This is simply a must for film fans. There's little or no investigation of the man himself or his private life. There are some photos from his youth, something about a distant physician father, a Quaker school and onto his first short in college. And we're off and running – from here on in it's purely film discussion. De Palma confesses that it was Vertigo in 1958, and later French New Wave films like The 400 Blows, Breathless and Week-end, that had a massive input on his early work. He explores his technique, particularly the split screen (he was fascinated with showing both the action and the reaction at the same time) used to great effect in Sisters but trimmed back somewhat during the prom scene in Carrie (he felt that the style didn't suit action and so only included it). Also car chases are boring with De Palma feeling that the car chase peaked in The French Connection. There are memories of good and bad reviews and his thoughts on the criticism that his films exhibit violence towards women (he says he had to use a big drill in Body Double because it had to go through the floor). As fascinating as all this is it's when De Palma gets around to naming names that the documentary really delights. Orson Welles isn't learning his lines in 1972's Get To Know Your Rabbit, a movie the director feels "didn’t work". There’s trouble with Cliff Robertson in Obsession. There's the removing of Oliver Stone from the set of Scarface, a movie he developed, left when the writer was fired, and rehired to shoot the new draft (incidentally the garish neon of Scarface is a reaction to the darkness of The Godfather). Connery has issues with his death scene in The Untouchables. There's tension on Casualties Of War set between Michael J. Fox and Sean Penn with the latter goading his co-star between takes, whispering "TV actor" in his ear. He defends his big flop Bonfire of the Vanities, saying "it's a good film IF you don't read the book" but admits the mistake in making Hanks' Sherman McCoy more likeable. Baumbach and Paltrow don't discriminate – the smaller movies get as much attention as the bigger ones - but what might have been fun if the directors allowed De Palma to explain further the "mistakes" in Carrie's sequels and remakes (including a musical). De Palma is veritable cornucopia of titbits with a pace that doesn't flag.